The holiday traditions I remember from growing up in New Mexico are Luminarias which are small paper sacks filled with sand with a small candle inside. Throughout New Mexico luminarias are a special attraction all over the state and have become so popular that people travel great distances to see the displays. Another tradition is having a steaming bowl of Posole Stew on Christmas Eve. Posole comes from the cultures of Native Americans, Mexicans and Europeans and is known as a dish for celebrating life’s blessings. 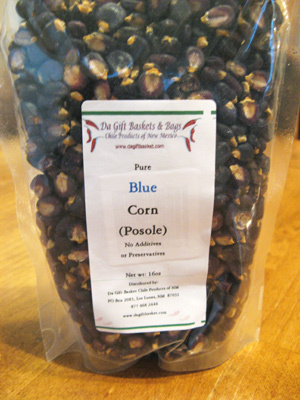 Posole corn is the hard dry corn kernels otherwise known as hominy. I still feel connected to New Mexico even though I no longer live there and count my blessings for all the traditions I grew up with. 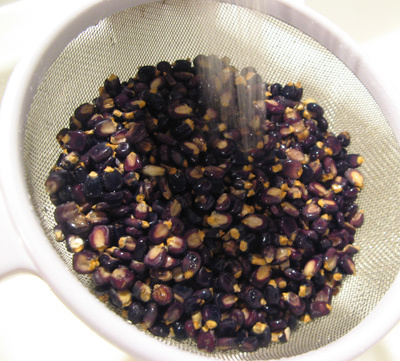 My sister Kat gave me some dried blue corn posole that I’ve been saving for a special occasion. 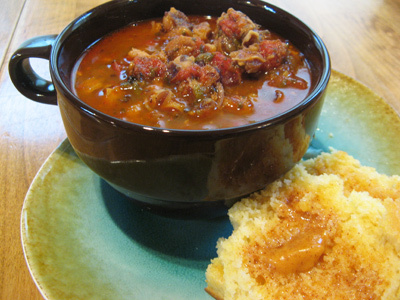 Canned hominy can be used in place of going through the process of cooking the posole. If you choose the canned route, skip the next few steps. 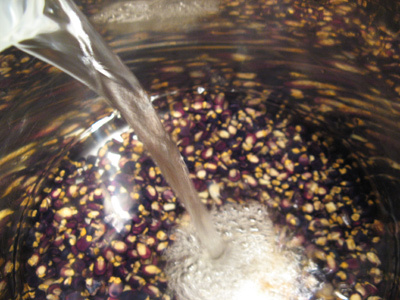 Rinse 2 cups of dried posole under running water. In a large stockpot cover posole with 6 cups of water. 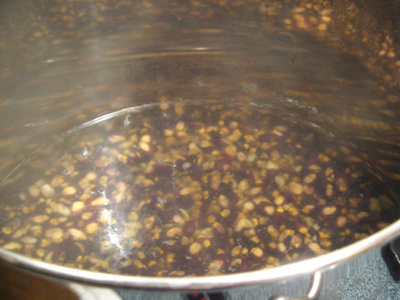 Bring water to a boil, cover pot and simmer 1 1/2 to 2 hours, or until the kernels pop open. I found it needed a little more time. I cooked the entire bag of posole and only used about half of it. The rest I put up in the freezer. To get started, cut and trim a 2 1/2 pound pork roast into 1/2 inch cubes. 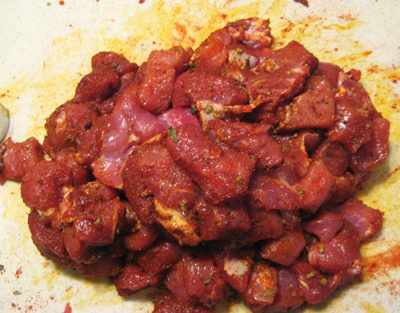 I seasoned the meat with smoked spanish paprika, mexican oregano, ground ancho chile and salt. A box of chicken stock will come later. Dice one whole onion and mince 2 cloves of garlic on a microplane hand grater. I roasted 2 poblano chiles in the oven, then peeled, seeded and chopped them. 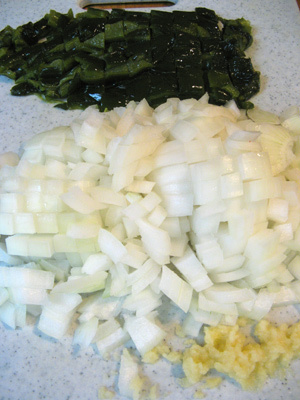 If you are in a hurry, chop the poblano’s and cook them along with the onions. I roasted them as a preference. 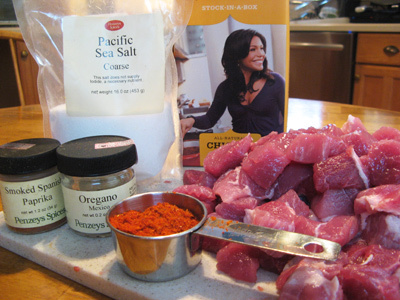 Mix together the salt, smoked spanish paprika, ancho chile, and oregano. Sprinkle over the cut up pork and using your hands work it all together so that all the pieces of meat are coated with the seasoning. That seasoning is going to sear into the meat and be really tasty. 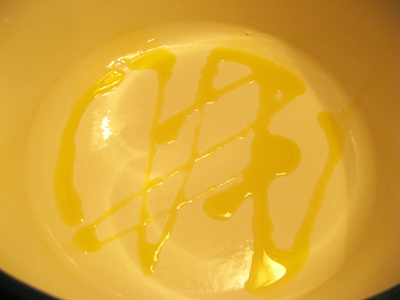 Heat a dutch oven and drizzle with olive oil. Place all the seasoned pork into the dutch oven. As it starts to sizzle, stir it around. Add the onion, garlic and poblano to the pot and pour stock over the top and stir. Time to add the posole back into the pot. Bring the stew just to a boil. 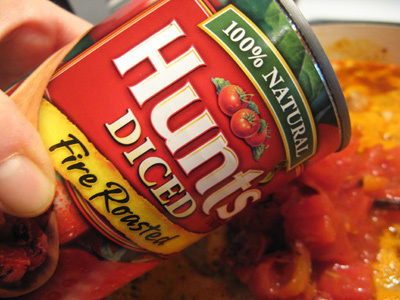 Turn the heat down and add a can of diced tomatoes. I love the fire roasted tomatoes. Cover the pot and simmer 30 minutes. At this point I took a taste to see if it needed more spice. I added a tablespoon more chili powder because we like it spicy. I put it back on the stove to simmer. You can serve the stew at any time, but I like to let it simmer for at least a couple hours. 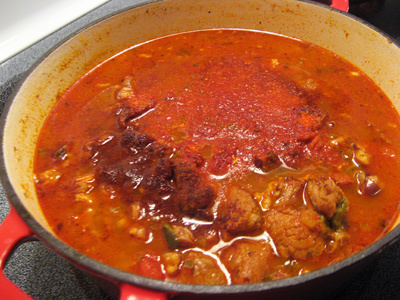 The pork will fall apart tender and the stew will be more flavorful. Before I had a dutch oven, I would simmer this all day in the slow cooker. Take another taste to see if it’s as good as it looks. Smell the aroma . . . .
And ladle some into your favorite bowl. 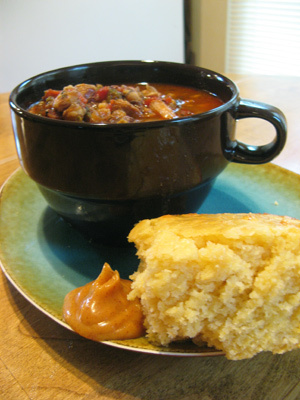 A slice of sweet cornbread with ancho honey butter makes this meal complete. 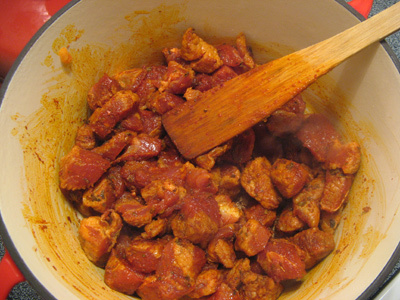 Blend together 3 tablespoons ancho chile powder, 1 tablespoon oregano, 2 teaspoons smoked paprika and 1 teaspoon salt. 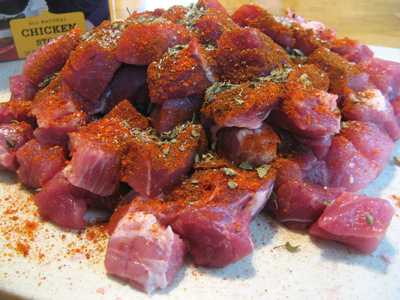 Sprinkle spice blend over cut up pork, tossing well to coat all pieces. 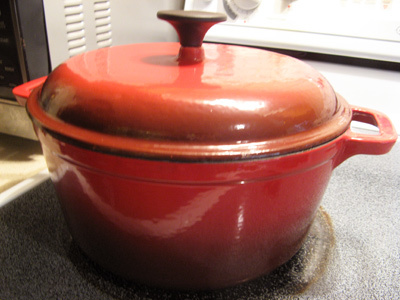 Heat olive oil in a dutch oven or stockpot. Over medium high heat add pork to the dutch oven and stir, browning meat on all sides. 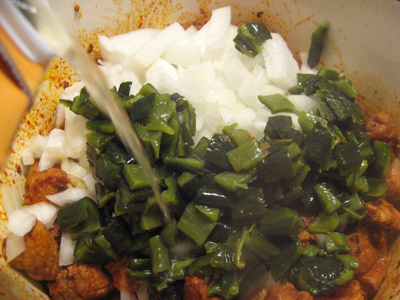 Add the chopped onions, poblano peppers and garlic. Pour the box of chicken stock over the pork mixture and stir. 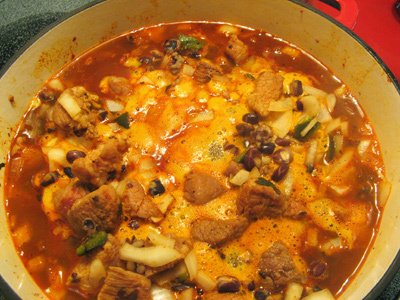 Add the cooked posole or canned hominy to the mixture and bring to a boil. Stir in 1 can of diced tomatoes and turn down the heat to a simmer. Cover the pot and let simmer 30 minutes. 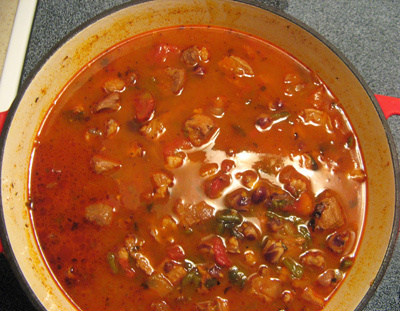 Taste the posole and if desired add additional 1 – 2 tablespoons ancho chile powder for a spicier stew. Note* The stew can simmer on low for several hours if desired. 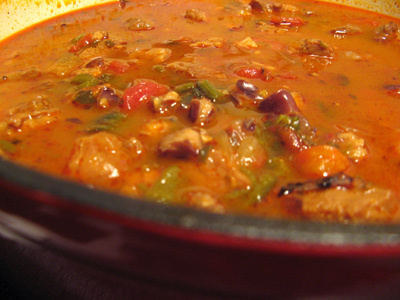 The longer is simmers the more tender the pork and more flavorful the stew will be. 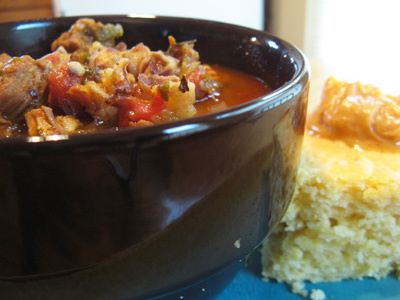 Ladle into bowls and serve with Sweet Cornbread and Ancho Honey Butter. 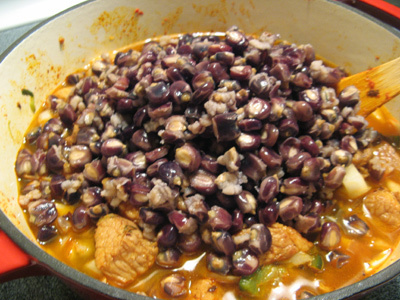 I discovered your blog while searching for a recipe for Blue Corn Posole, I love your recipes and look forward to trying this today. I used slaked lime calcium hydroxide) on my blue corn before cooking. I soaked the corn in just water for several hours first (that corn was really thirsty…it soaked up all the water fast) then added the lime. Boiled for about 30 minutes in water/lime solution then let sit for 6 hours. Afterwards, I rinsed the corn very well and now it’s back in the pot. The corn was actually edible after I rinsed the lime away but for posole it needs to be much more tender. Never did it this way before but I will do it this way from now on. I’m thinking of the possibilities. Another note, I’ve had that corn for about 5.5 years stored in an airtight container. Almost tossed it but decide to give this a go. It worked! Btw, I’m in ABQ. Thanks for sharing! That’s awesome that your dried corn turned out so good. Soaking the dried corn in slaked lime calcium is the process I see most often in recipes for posole so you are spot on! I am always so happy to hear from anyone from New Mexico. I am a Native New Mexican, grew up in Tucumcari and lived in Albuquerque for a few years. Sure do miss NM, hope to move back someday.